LoneRanger1975	 12-16-2018 12-29-2018 Success 13 7/7 Sent seven cards and a hand written letter asking for his autographs. Received cards back signed in black and blue sharpie. Awesome he stopped and put thought into the pens used. JustStartingOut	 09-14-2018 09-22-2018 Success 8 4/4 LOR, SASE, Four cards. Signed all four in black. Thanks, John. JustStartingOut	 02-27-2018 03-09-2018 Success 10 5/4 Sent one Beckett magazine and four cards, including OPC rookie. Signed 3 of four cards and the magazine. This is awesome. He was my favorite Flyer during the LOD era. 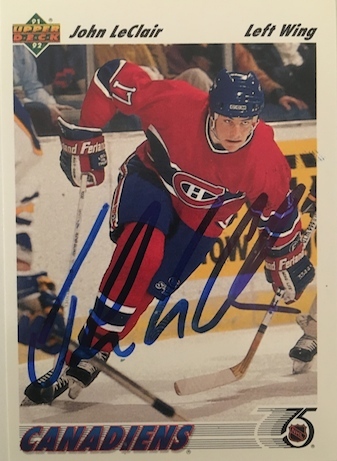 Hockeycardalex	 02-26-2018 03-27-2018 Success 29 2/2 Sent letter, SASE and two cards. Received both back signed, but unfortunately one has really bad smudging/water damage that rubbed onto the back of the other. Oh well. Thanks! kitchead	 12-22-2017 01-10-2018 Pending 19 5/5 5/5 (four cards and a jersey number) Signed Habs in Blue and Flyers in black. Johnmc83	 06-12-2017 06-19-2017 Success 7 3/3 3/3 in 7 days! Class act. Thank you Mr. LeClair! Eddie_2	 02-21-2017 02-28-2017 Success 7 2/2 7 days. 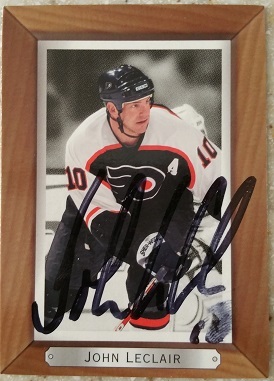 Signed two Flyers cards in black sharpie. Philly4Life	 01-19-2017 01-25-2017 Success 6 1/1 Sent puck, LOR and SASE. Got it back signed! toddannis	 01-04-2017 01-17-2017 Success 13 2/0 Sent LOR, SASE, 93P&FU and asked for inscription. Signed 2/2 no inscription. Baumans916	 11-16-2016 12-02-2016 Success 16 3/3 Sent 91-92 UD, OPC and 94-95 UD w SASE. 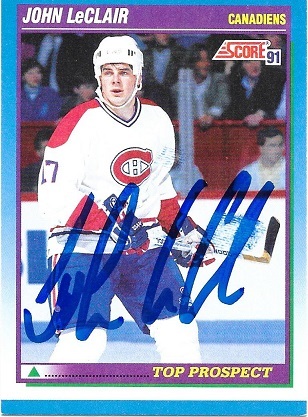 John signed the mtl cards in blue & phi card in black. Philly4Life	 05-26-2016 06-02-2016 Success 7 1/1 Sent LOR, SASE and Mcfarlane base. Got it back signed exactly where I asked and it looks awesome! Philly4Life	 05-26-2016 06-02-2016 Success 7 1/1 Sent LOR, SASE and McFarlane base. He signed it perfectly and exactly where I asked! Looks awesome!! goblackhawks123	 05-09-2016 05-19-2016 Success 10 2/2 Sent 2 cards. Signed 2/2 in blue & black sharpie. 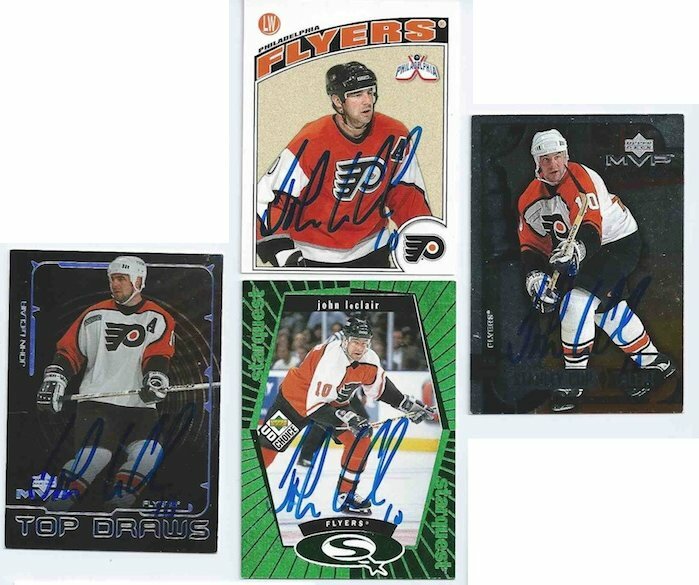 CarolinaGraphs	 02-25-2016 03-08-2016 Success 12 1/1 2014 Upper Deck Artifacts signed in black ink. abonham1	 02-24-2016 03-24-2016 Success 29 3/3 signed all 3 cards in black sharpie. 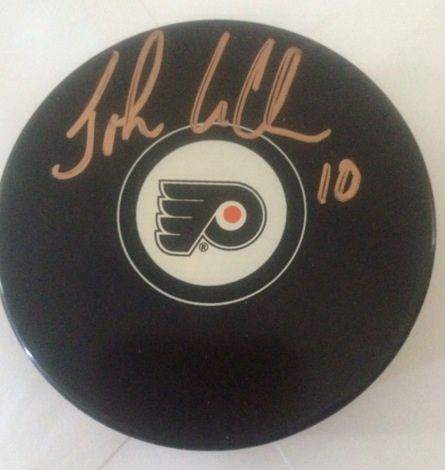 Philly4Life	 11-12-2015 11-19-2015 Success 7 1/1 Sent Flyers Retirement puck, LOR and SASE. Got it back signed and he returned the paint pen! Just need Lindros now to finish it! PortRadelaide	 04-28-2015 05-13-2015 Success 15 3/2 Thanks! Signed the back of the card, perhaps this is a means of thwarting sellers? Too bad, but glad to have the card for my collection! Philly4Life	 03-05-2015 05-01-2015 Success 57 1/1 Sent black Flyers mini helmet. Signed just where I asked him. Kept sharpie. Coltron57	 12-01-2014 12-12-2014 Success 11 4/4 4 cards. Signed nicely in blue and black. Gmbs82	 07-11-2014 07-17-2014 Success 6 1/1 flyers puck 6days!!!! MrCardCollector97	 05-05-2014 05-10-2014 Success 5 2/2 Super quick response! blewch	 04-02-2014 04-24-2014 Success 22 7/7 Great return. Signed all 7 including OPC rookie. Marcus26	 12-23-2013 01-07-2014 Success 15 5/5 Signed all cards. 15 Days! Awesome signature. Thanks Mr Leclair! 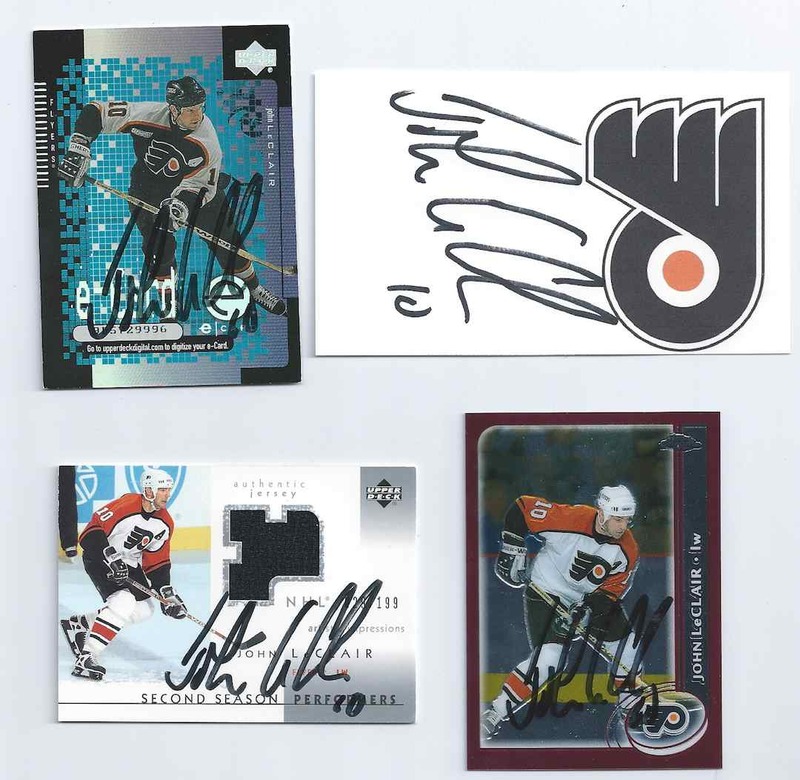 Cmoney66	 12-10-2013 12-14-2013 Success 4 1/1 signed my 97-98 UD card, 4 Days! jeff8372emt	 12-09-2013 12-16-2013 Success 7 4/4 Signed 4 custom photos. NotLou	 11-18-2013 11-25-2013 Success 7 6/6 Signed my G/U cards in blue sharpie and added #10 to all! policeradio556	 09-30-2013 10-03-2013 Success 3 1/1 1 8x10 Signed in 3 days!!!! antdag3	 08-09-2013 08-16-2013 Success 7 6/6 Sent him 6 cards...signed & returned all quickly! mrwoodland	 07-17-2013 07-27-2013 Success 10 4/4 awesome return! Coltron57	 07-17-2013 07-26-2013 Success 9 4/4 Sent 2 RC, a UD Portrait, and an Atomic. All came back signed, but all smudged. sugarpooper	 06-04-2013 06-11-2013 Success 7 4/4 Very fast turn around, Thanks Mr. Leclair!! antoine38	 09-07-2012 09-17-2012 Success 10 4/4 Signed all my cards, Excellent! bluesfan76	 08-01-2012 08-08-2012 Success 7 1/1 Topps '91 Base Card. 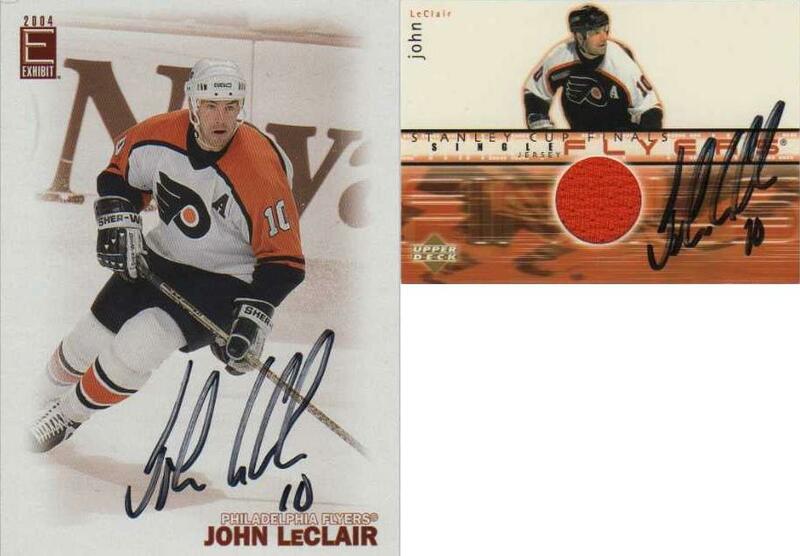 First Hockey TTM - TY Mr. LeClair. Coltron57	 07-29-2012 08-06-2012 Success 8 4/4 Sent 4 base cards, including a 1991 Pro Set Rookie. Lapo0013	 07-18-2012 07-30-2012 Success 12 1/1 Sent 1 gu jersey card. Signed beautifully in black! lovergine1	 07-06-2012 07-13-2012 Success 7 4/4 signed all 4 cards, two RC's. quick turnaround. Thank you ! comfortably9numb	 06-17-2012 06-27-2012 Success 10 3/3 signed all cards! 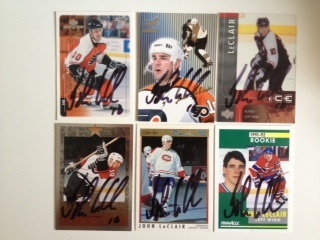 RocklandBoulders	 04-11-2012 04-19-2012 Success 8 1/1 First Hockey TTM Thank You Mr.Leclair! 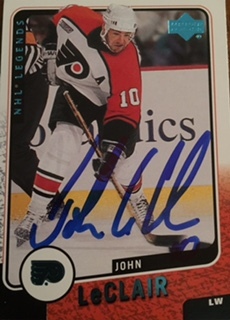 policeradio556	 04-06-2012 04-11-2012 Success 5 3/2 Sent 3 rookie cards to be signed..Signed 2 in blue sharpie and kept the other one....Thanks Johnny! Philly4for4Fan	 03-07-2012 03-10-2012 Success 3 1/1 Got my McFarlane Base back in four Days!!!!! Lapo0013	 02-13-2012 02-25-2012 Success 12 1/1 Great sig, thanks john!! Pens-fan-addict	 01-23-2012 01-31-2012 Success 8 1/1 1 - Pens 8x10 (Auto'd & Personalized!) 9 day turnaround!! just for the fun	 01-09-2012 01-17-2012 Success 8 1/1 signed my upperdeck. 8 day turnaround. thanks mr. leclair! stop__dreaming	 11-21-2011 12-05-2011 Success 14 2/2 A 2 week turn-around (Trans-Atlantic!!) just goes to show how classy he is. Fantastic. Thank you, Mr LeClair. 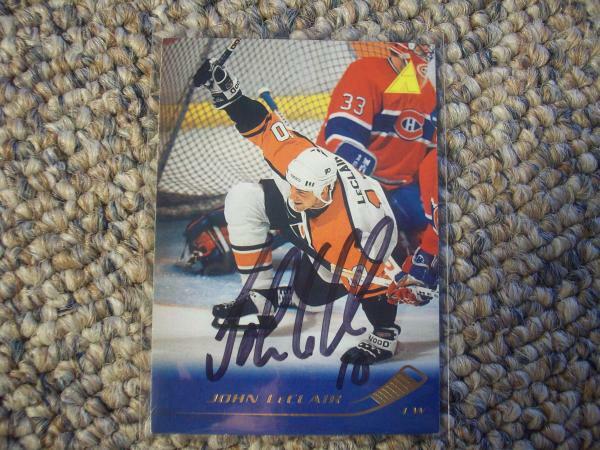 bigsportsfan1	 11-15-2011 11-28-2011 Success 13 3/3 John signed all 3 of my cards in blue sharpie. Very fast turnaround. Thank you John. druce26	 10-14-2011 10-18-2011 Success 4 2/2 Signed my Starting Lineup! bounty331	 09-26-2011 10-03-2011 Success 7 2/2 Nice sig! RyanRizz715	 06-03-2011 06-09-2011 Success 6 1/1 Fastest return yet!! Riggs	 05-13-2011 05-20-2011 Success 7 2/2 Great signer, FAST turnaround..
Eddie_2	 04-12-2011 04-15-2011 Success 3 2/2 Sent again to get Flyers cards signed. Only 3 days! Super fast TTM from one of the best TTMers in sports! snartly	 03-31-2011 04-07-2011 Success 7 2/2 Sent them back on April 5th. Great signature. My first true TTM autograph. Plenty of more to come! Eddie_2	 02-19-2011 02-23-2011 Success 4 1/1 Super fast TTM...only 2 days! (Not counting Sunday or Pres Day). Mr. LeClair signed my card in black sharpie. Very nice return. ydfthunder	 07-27-2010 08-02-2010 Success 6 3/3 6 days! nice signature. samjams3	 08-21-2009 08-29-2009 Success 8 4/4 Signed all 4 cards I sent. One of them was smudged, but the other 3 are perfect.